What is a Veterinary Specialist? How are they different from my family veterinarian? In addition to completing undergraduate training and four years of veterinary school, Board-certified veterinary specialists are similar to their human medical counterparts in that they have completed an internship and residency in their specialized field—an additional 3 to 5 years of training. In addition to this extensive training, a Board-certified veterinary specialist must pass rigorous examinations to achieve Board certification from the American College of Veterinary Internal Medicine or American College of Veterinary Surgeons. Specialists bring a greater understanding in the area of internal medicine, cardiology, oncology, neurology, surgery and have a greater knowledge of the unusual, the uncommon, or rare in both large and small animals. A Specialist may also use diagnostic equipment not generally used by your family veterinarian. Internal Medicine specialists focus on the diagnosis and treatment of diseases in gastrointestinal, urogenital, endocrine, respiratory, and hematologic systems. Learn more about our internal medicine specialty here. A surgery specialist is trained to provide advanced surgical procedures to help in the diagnosis and treatment of your pet. Learn more about our surgery specialty here. The Diagnostic Imaging at the Central Toronto Veterinary Referral Clinic offers a wide array of imaging modalities available in veterinary medicine. Learn more about our diagnostic imaging specialty here. Cancer treatments can vary widely and in the majority of cancer treatment can result in excellent quality of life for your loved ones. Learn more about our oncology specialty here. Advanced laboratory testing of various tissue and blood samples. A surgery specialist is trained to provide advanced surgical procedures to help in the diagnosis and treatment of your pet. Orthopedic surgery: fracture repair, ligament surgery, angular limb deformity correction, and arthroscopy. Soft tissue surgery: examples include mass removal, exploratory laparotomy, intestinal surgery, laparoscopy, portosystemic shunt repair, gall bladder surgery, thoracoscopy, lung lobectomy, brachycephalic surgery, total ear canal ablation for chronic otitis or tumours, skin and reconstruction following tumour removal or extensive wounds, facial surgery (maxillectomy, mandibulectomy), thyroid/parathyroid removal, and pareneal hernia repair to name a few. Founded in 1965, the American College of Veterinary Surgeons is the American Veterinary Medical Association specialty board which sets the standards for advanced professionalism in veterinary surgery. Following the 2011 certification examination, ACVS has come to include more than 1,540 Diplomates. Approximately 70 veterinarians earn their Diplomate Credentials every year. More than 60 percent of the ACVS Diplomates operate in private and specialty practices that accept cases on a referral basis from primary care practitioners. The remainder are primarily employed by academic institutions and industries where they teach, conduct research, practice in teaching hospitals, and participate in the development of new products and treatments which improve the quality of veterinary and human health care. What is an ACVS diplomate? The term “ACVS Diplomate” refers to a veterinarian who has been board certified in veterinary surgery. Only veterinarians who have successfully completed the certification requirements of the ACVS are Diplomates of the American College of Veterinary Surgeons and have earned the right to be called specialists in veterinary surgery. Veterinarians wishing to become board certified must complete a three- year residency program, meet specific training and caseload requirements, perform research and have their research published. This process is supervised by current ACVS Diplomates to ensure consistency in training and adherence to high standards. Once the residency has been completed, the resident must sit for and pass a rigorous examination. Only then does the veterinarian earn the title of ACVS Diplomate. The Animal Care Team is made up of the owner (client), the general practice veterinarian and the ACVS specialist. Rapid advances in the veterinary profession can make it difficult for veterinarians to remain current with recent developments in techniques and technologies, , but these advancements often hold the answers to today’s complex surgical problems. Possessing the training, expertise and equipment to perform the most demanding procedures, the ACVS Diplomate can help the primary care veterinarian provide the best possible care to the patient. Once the referral is made, the ACVS Diplomate will provide state-of-the-art surgical patient care. As part of the healthcare team, the surgeon will keep the referring veterinarian and client informed of the patient’s progress throughout the specialized care. After patient discharge, the referring veterinarian may also provide additional postoperative follow-up care. This continuity between surgical specialist and primary care veterinarian ensures the best possible outcome for the patient. The Diagnostic Imaging at the Central Toronto Veterinary Referral Clinic offers a wide array of imaging modalities available in veterinary medicine. The clinic is equipped with a digital radiology system and ultrasound. The clinic has a CT scanner that produces 3D imaging allowing for more accurate diagnosis, treatment planning and monitoring. It is also useful for better evaluating the lungs, staging cancer, planning surgeries, endoscopies, or radiation treatment. Our CT scanner’s uses a cone beam technology which allows us to image our patients faster, reducing anesthesia times, and to acquire higher resolution images. When we hear the word “cancer” we immediately fear the worst. However that fear may be unfounded. Cancer is a diverse and complex disease with a wide range of clinical outcomes. Treatments can vary widely and in the majority of cancer cases treatment can result in excellent quality of life for your loved ones. For the owners of pets diagnosed with cancer or a suspicion of cancer, the diagnosis can be overwhelming and often confusing, but there is help. Dr. Kevin Finora, DVM, Diplomate ACVIM (Oncology) is the only double boarded onco/medicine veterinary oncology specialist in Toronto. Dr. Kevin Finora is an expert in the newest cancer care. He will help guide you and your pet through the difficult decisions. Dr. Finora will determine the most appropriate course of treatment and coordinate the treatment program for pets with cancer. While there are hundreds of different types of animal cancers, we understand that the one you care about most is the one that your pet is facing. The veterinary oncology team at Central Toronto Veterinary Referral Clinic is here to support you and your companion on this journey, bringing together exceptional cancer expertise and most effective treatments. We know what it means to confront life and death decisions. Our team is dedicated to successfully treating a patient’s cancer and, most importantly, are committed to providing the best quality of life for your pet. Our staff looks forward to working with you. We pay attention to all aspects of our patients’ experience. Our clinic offers not only the best medical knowledge, experience, and technology, but also top-quality care rooted in the kindness, understanding, and professionalism of our staff. 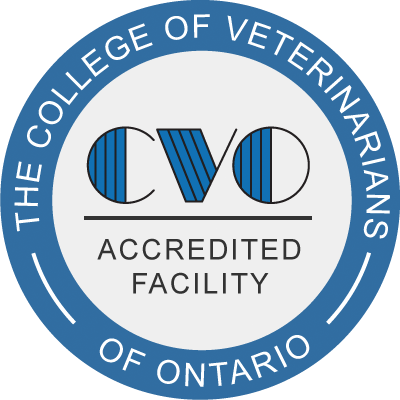 CTVRC and CTVEC are accredited by The College of Veterinarians of Ontario.